Newly crowned world champion Radik Isaev is known as the comedian of Azerbaijan's Taekwondo squad, but he is deadly serious about success at the European Games. The rangey 25-year-old fighter had the air of Muhammad Ali in his prime as he prepared for the Games, throwing the odd dance, shuffle and joke into tough sparring with his team-mates. But, despite the smiles, Isaev was dripping in sweat after the session at the national training centre. Asked about his motivation, he said simply: "Look, I'm the breadwinner in my household. I have to feed my family. This is my job." Isaev won his first global gold medal in the -87kg category at the world championship in Russia last month. The fighter is one of the favourites for the heavyweight competition (+80kg) in Baku, where his 2.01m height and long legs give him an extra edge to deliver decisive head shots. "I have always had good relationships with the Azerbaijan guys and we got on well," he said. "When they invited me to be part of their team, I decided to come. The mood is great in the camp." 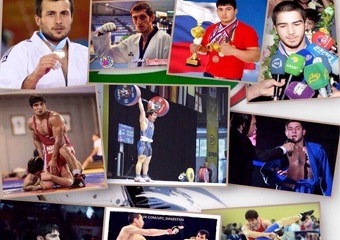 Isaev's wife and two daughters, aged two-and-a-half years and five months, have stayed in Dagestan with his mother while he trains in Baku and competes internationally. Coach Elnur Amanov said: "There's no doubt he's the joker in the squad. He often turns up and, as a joke, starts sparring with the smallest fighter in the women's team. Or he will put on some mad music for training or turn up to official functions in a baseball cap."